We had a shift in health priorities at our house over the holidays. Mr. Curtis essentially had a heart attack (the doctor said it was a "heart event" since his heart damage wasn't severe). Doesn't matter what you call it, it was a wake-up call. Mr. Curtis was a college athlete, a high school basketball coach and athletic director. He's married to me (a self-proclaimed gym rat) and can be found at the gym 4-6 days a week. All that exercise didn't make a bit of difference to his arteries. He ate like a 17 year-old boy - soda, chocolate, fast food. Last week, I told my man that I was tired of making the four vegetables he finds palatable - mushrooms, asparagus, broccoli, cauliflower. Last week, I threatened him with a new vegetable - spaghetti squash. 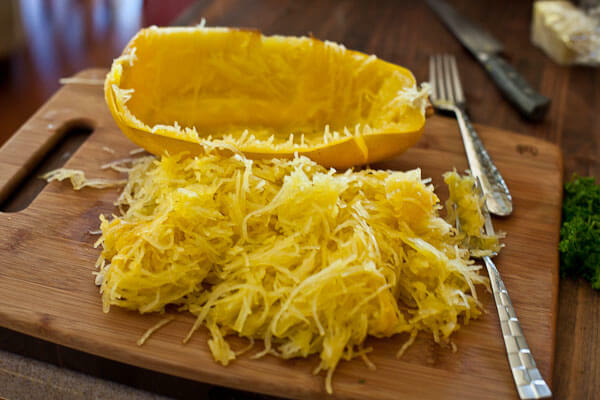 "What is spaghetti squash? It sounds like something your mother would make." Spaghetti squash is surprisingly hard to cut. Poke about 6 slits in yours with a knife, like you would a baked potato (my mom liked to poke them in a dotted line where she was going to cut later). Put it in the microwave and cook for 4-5 minutes. It will be hot. Let cool, and then take a knife to it and cut it in half lengthwise. 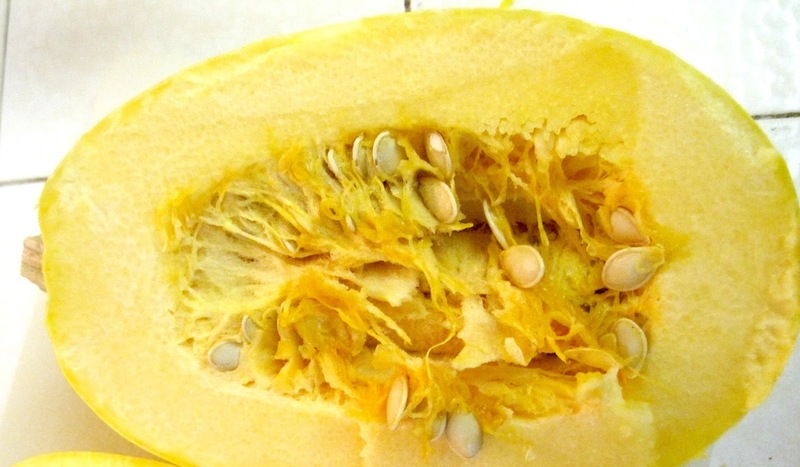 Scoop out the seeds and basic strings like you would a pumpkin, leaving about 3/4" of pulp on the rind. Season each half with your preference: a little olive oil, salt/pepper, garlic, etc. You can either bake it for about 30 minutes at 350 degrees (face down), or put it back in the microwave on a microwavable plate for about 10-12 minutes (face down). Then you take it out, let it cool enough that you can handle it, and scrape out the "spaghetti" with a fork (see photo above). My mom never served this to us in place of regular spaghetti noodles, but you can. My mom always made it in some kind of casserole with other veges and cheese. So I made a casserole with spinach, grape tomatoes, chicken, and - of course - cheese. It passed the finicky man test. I hope to broaden Mr. Curtis' horizons more in the coming months. Do you have a vegetable you make that your family once turned up their noses at? I'd love to hear about it! 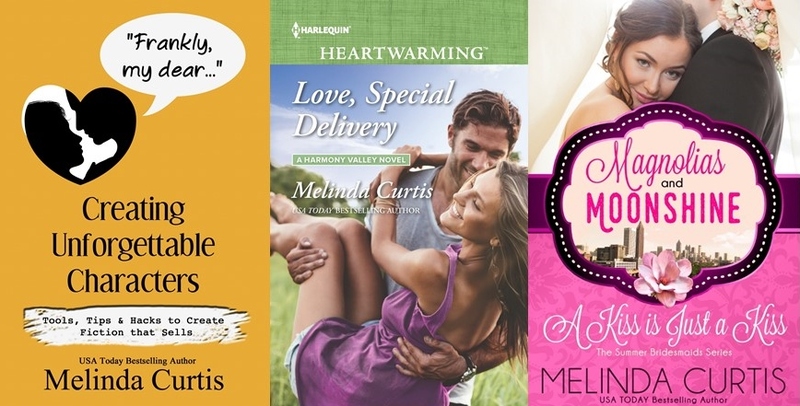 Melinda Curtis is an award-winning USA Today bestseller of contemporary romances. Her latest releases are on pre-order: Frankly, my dear...Creating Unforgettable Characters (3/21 on Amazon); Love, Special Delivery (4/4); and A Kiss is Just a Kiss (4/27). My family usually hates cauliflower until I found a recipe that involves baking it with olive oil and a little parmesan cheese. It's simple and good. I will have to try the spaghetti squash recipe. It sounds delicious. Thanks for sharing. What vegetable doesn't my family stick their noses up at? Well, I've tricked them. I've added Kale to their after school fruit shake, and my husband loves it, too. Win! I love this squash. My dh loves it with shrimp and the olive oil garlic and parmesean. Mel, have you tried roating veggies--My dh loves so manymore than before cooked this way. BTW-long ago when I had a garden--one year I grew 42 ssquash--we were eating them through Feb--they just aged in my basement shelf and got sweeter and sweeter! Melinda, have you tried steaming cauliflower, blending it with fat free half and half, salt, pepper, spices or garlic powder, then serving it like mashed potatoes? Even my potato-loving sons will eat it. Also, roasting different vegetables together, like butternut squash, Brussels sprouts, and broccoli works well. I cut them up, put them in a plastic bag, add olive oil and spices, then toss them in the bag until all the pieces are coated, then pour them into a pan and roast at 375 degrees until they're tender. I'm incredibly blessed as my toddlers are not picky eaters at all. They love to try new veggies, especially if we grow them in our garden. Our favorite summer salad is diced cucumber and tomatoes with a little balsamic vinegar and olive oil, then sprinkled with salt and pepper to taste. You are not alone - we're not good with vegetables here at our house, either. We've tried spaghetti squash and I thought it was pretty good. You're right, though, it's not easy to cut! I hope all in your family have continued good health. I've always been curious about spaghetti squash but never actually tried it. I may have to now. I've also been known to shred carrot on a pizza. Looks cheese-like, but I used cheese too--just not as much. When I sneak vegetables in, I announce after the meal, so the unsuspecting diner realizes he likes veggies more than he thought. I love spaghetti squash! But I also find it easier to cook winter squashes like butternut or spaghetti squash in the slow cooker. I don't even poke them...just wash them and put them in the slower cooker on low. They're easier to cut once they're cooked.